Qualcomm has announced a new version of its aptX audio platform at IFA 2018, which aims to deliver the same performance and quality of a wired audio connection. The headphone jack is dying as the rise of wireless continues its march across our devices - Qualcomm says the wired connection is going away - but there’s potentially good news for audiophiles worried about a poorer, wireless audio experience. AptX Adaptive is the latest version of the firm's wireless sound technology, and Qualcomm claims it provides a robust, hi-res and virtually glitch-free listening experience. It's not just focused on music playback though, as aptX Adaptive has been tuned to improve audio response for gaming and movies. Current Bluetooth doesn't address latency issues - which proves problematic when gaming or watching video - and it's an issue you don't get with a wired connection. What the Adaptive upgrade provides is a wire-like low latency experience which Qualcomm hopes will encourage more users to ditch the wire and adopt wireless headphones. AptX Adaptive will dynamically adjust wireless audio performance depending on content you are consuming - be it music, video or a game - which takes the hassle of manual adjustment out of the equation. Qualcomm tells us that aptX Adaptive will be available "on a Snapdragon chip to be named in the future", which we expect to be the Snapdragon 855 which is tipped to launch at the start of December. 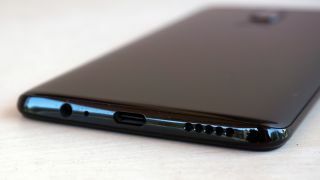 That means the first smartphones to boast this new Bluetooth audio technology likely won't arrive until the middle of 2019.